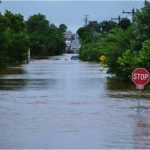 Recent flooding in Texas and Oklahoma put NSSL’s experimental Multiple Radar Multiple Sensor (MRMS) Flooded Locations and Simulated Hydrograph (MRMS-FLASH) system to a rigorous test, and researchers were pleased. 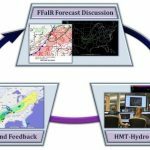 The real-time MRMS-FLASH hydrologic modeling suite produces forecasts of flash flooding that are compared to historical simulations that use more than a decade of NEXRAD-based inputs at each 1km grid point. 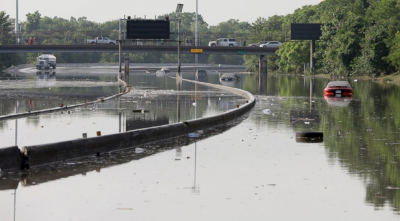 On May 25, the City of Houston, Texas, experienced deadly flash flooding. 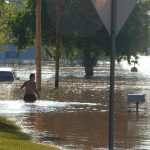 For this event, FLASH predicted extreme water flows out to six hours in advance. 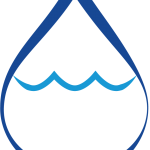 The Coupled Routing and Excess Storage (CREST) distributed hydrologic model, also a part of the MRMS-FLASH modeling suite, generates maps of streamflow and unit streamflow (cubic meters per second per square kilometer) every 15 minutes. Comparisons between the observations of flash flooding in Houston and the maps of unit streamflow show a good correspondence between areas of high unit streamflows and flash flooding. The FLASH model represents surfaces that do not absorb water, such as in urban zones, and is able to model dynamic soil moisture conditions, and how water will be routed downstream. MRMS-FLASH has run in real-time demonstration mode for several years.